#1 Insulated Copper Wires (I.C.W.) 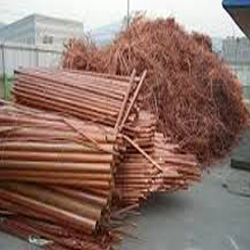 are some of the most common copper materials found in scrap yards and around construction sites. They consist mainly of insulated copper wires including Romex® wires, household wires, and similar higher gauge wires, typically used in electrical applications with an average copper recovery rate of 85%. #1 Insulated Copper Wiring can be found in automotive parts, household appliances and applications, mechanical components and others. It is often worthwhile to clean and remove plastic and paper coatings from wiring, using manual tools or electric wire strippers, to produce bare bright materials which have a higher value. #1 Insulated Copper Wires are considered to be very valuable scrap materials due to their copper content and can be sold to scrap yards and dealers at high prices, usually by the pound.